Over the past few decades considerable progress has been made in terms of our ability to reconstruct post-infective soft tissue and bone defects. Soft tissue reconstruction is not always required and it is frequently possible to achieve a tension-free closure of well-perfused tissue following debridement. It is now generally accepted that primary closure of the wound, be it by direct suturing or tissue transfer, may be performed at the same sitting as the debridement. In cases were debridement has resulted in tissue loss, muscle or musculocutaneous flaps appear to be superior to random-pattern flaps in achieving resolution of infection. The management of bone defects is dependent on several factors including the host's physiological status, the size of the defect, duration of the defect, quality of the surrounding soft tissue, the presence of deformity, joint contracture / instability or limb length discrepancy, as well as the experience of the surgeon. Surgery remains the mainstay of treatment when a curative treatment strategy is selected. As is the case with chemotherapy for bone tumours, antibiotic therapy fulfils an adjuvant role in curative management strategies. The choice of antibiotic, in this setting, remains a very difficult one and there are many problems with the interpretation of 'cure rate' data. The controversy surrounding the optimal duration and route of antibiotic therapy has not been resolved. The second role of antibiotics in the management of chronic osteomyelitis is disease suppression as part of a palliative treatment strategy. Further studies are required to clarify which patients may successfully be treated with antibiotics alone. Keywords: osteomyelitis, chronic, management, review. 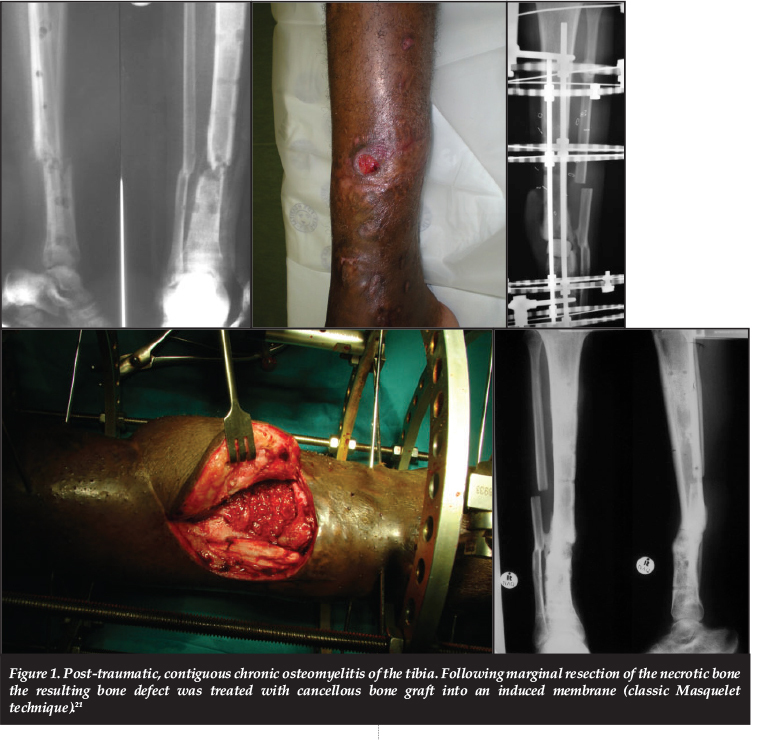 The preceding article in this series aimed to elucidate current concepts in the diagnostic work-up and surgical management of chronic osteomyelitis. In this paper post-infective soft tissue and skeletal reconstruction, as well as the principles of antibiotic therapy, will be addressed. There are several controversial issues related to these subjects. The optimal choice for soft tissue cover following debridement, for example, remains controversial. Although several techniques have been described to deal with bone defects, a comprehensive contemporary strategy has not yet been described. In terms of antibiotic therapy, clear evidence-based guidelines are also lacking, especially in terms of the selection of the appropriate antibiotic agents, the optimal duration of treatment and the ideal route of administration. In many cases it is possible to achieve a tension-free closure of well-perfused tissue following debridement. Unfortunately the excision of ischaemic tissue and sinuses frequently result in a soft tissue defect. It is now generally accepted that primary closure of the wound, be it by direct suturing or tissue transfer, may be performed at the same sitting as the debridement.2,3 Cierny, however, emphasises the importance of systemic and local antibiotics, as well as a double setup in case of a single stage procedure. This involves re-scrubbing of all staff members, repeat preparation and draping of the patient, as well as the use of new instruments for the reconstructive part of the procedure.4 Delayed primary closures may still be required in certain cases where, for example, a second look at the viability of remaining tissue is required, soft tissues are not amenable to closure due to swelling or induration, or where a second team is required to perform a complex free flap. Several other salvage techniques have emerged in the recent past. Negative pressure dressing has been employed successfully in the management of many soft tissue defects. It has, however, a limited role in the management of chronic osteomyelitis as it results in the formation of dense and poorly vascularised scar tissue. The application of vacuum dressings to draining sinuses in particular is discouraged as it significantly complicates subsequent surgery.4 Vacuum dressing may occasionally be considered in severely compromised hosts where tissue transfer is deemed impossible. More recently negative pressure wound therapy combined with the instillation of solution in the local area (VAC instil therapy) has been proposed as a viable alternative in the management of osteomyelitis-associated soft tissue defects.13 This form of therapy is attractive as it offers the theoretical advantages of both the Lautenbach technique and negative pressure wound therapy. As a last resort, in certain cases where the local soft tissue condition does not permit flap coverage, open skeletal transport (in accordance with Ilizarov principles) may be considered. Acute shortening, with primary docking of the bone ends, of up to 4 cm has been advocated for post-traumatic bone loss.16 Unfortunately the soft tissue scarring associated with chronic osteomyelitis rarely permits acute shortening beyond 2 cm. Not only does acute shortening in the presence of significant scar tissue present technical difficulties with wound closure, it also carries a particular risk of vascular compromise as a result of kinking of blood vessels which are immobilised by rigid soft tissues. Acute shortening of 1-2 cm can, however, be used as part of a combined strategy, which may include the induced membrane technique along with bone grafting or bone transport. The advent of induced membrane techniques has, however, increased the potential for the use of cancellous bone graft in much larger defects. Masquelet reported the successful use of this technique in 35 cases, with defects ranging from 4-25 cm.21 Others have been able to reproduce these results. Distraction osteogenesis, in accordance with the Ilizarov method, remains the gold standard in the management of post-debridement bone defects of 4 cm or more.16,23 This may take the form of acute shortening with subsequent lengthening or, more commonly, bone transport into the defect. 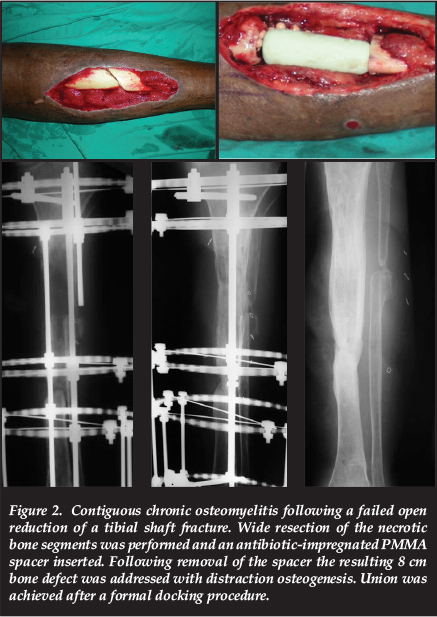 Distraction osteogenesis offers several advantages in the management of chronic osteomyelitis, including the increase of regional blood flow for a period of up to 17 weeks following the corticotomy.24 Large defects can be dealt with through simultaneous multifocal transport, sequential transport or cable-transport techniques. The upper limit of the size of defects which may be dealt with through distraction osteogenesis is, however, highly dependent on the surgeon's experience with the technique (Figure 2). A combination of techniques is commonly used. Ultimately the management of bone defects is dependent on several factors including the host's physiological status, the size of the defect, duration of the defect (i.e. acute or chronic), quality of the surrounding soft tissue, the presence of deformity, joint contracture/instability or limb length discrepancy, as well as the experience of the surgeon. It is important to note that surgery remains the mainstay of treatment when a curative treatment strategy is selected. As is the case with chemotherapy for bone tumours, antibiotics fulfil an adjuvant role in curative management strategies. Curative surgery should ideally involve a wide resection with clear margins. This goal is however frequently unachievable as it may result in unreconstructable loss of bone that is vital to the survival and function of the limb. Marginal resection may, on the other hand, leave behind colonised bone or soft tissue that may serve as a nidus for recurrent infection.28 Even in wide resections the remaining bone and soft tissue bed should also be considered contaminated. Antibiotics are, therefore, used in wide and marginal resections (curative surgical strategies) in an attempt to sterilise the remaining bone and soft tissues. In the curative setting empirical adjuvant antibiotics are typically started immediately following the debridement, and the regimen is modified once the culture and sensitivity results become available. Cotrimoxazole exhibits concentration-dependent killing, therefore higher than usual doses (7-8 mg/kg/day trimethoprim) are recommended in the treatment of chronic osteomyelitis.38 De Barros et al. reported an impressive 98% cure rate with 6 months of cotrimoxazole therapy following surgical debridement, although it may be argued that the extended duration of therapy may have resulted in disease quiescence through suppression.39 Rifampicin achieves bone levels equivalent to serum concentrations and when used in conjunction with other agents there appears to be a clear benefit in terms of cure rates.40,41 It should however never be used as monotherapy due to the risk of the development of resistance. Sanchez et al. reported a 100% cure rate in staphylococcal infections with surgical debridement in conjunction with double the standard dose of cotrimoxazole combined with rifampicin for a mean of five weeks.42 Similarly, cotrimoxazole combined with rifampicin achieved similar cure rates to both linezolid with rifampicin, as well as eight weeks of intravenous cloxacillin monotherapy, in the treatment of chronic osteomyelitis and infections associated with surgical implants.43,44 It is important to note that oral dosing of β-lactam antibiotics results in serum levels of less than 10% of parenteral administration. This pharmacokinetic characteristic raises concern regarding the ability of β-lactams to reach adequate MIC in bone, despite the fact that their penetration is better in infected than in uninfected bone.45 Clindamycin exhibits good bone penetration and many methicillin-resistant S. aureus strains are susceptible to the agent. Despite these characteristics there are no recent studies investigating the use of clindamycin in the management of osteomyelitis. The optimal duration of antimicrobial therapy following surgical debridement remains unknown. The traditional duration of treatment is four to six weeks. This is based on experience with the management of acute osteomyelitis in children, where extended periods of antibiotics are required, as well as the results of animal studies which illustrated that six weeks of antibiotics was effective in sterilising diseased bone.49 This traditional recommendation is also derived from the assumption that revascularisation of bone following debridement takes about four weeks.50 Several studies have failed to demonstrate increased efficacy of extended duration antibiotic therapy.51 Furthermore, the absence of standardised treatment algorithms makes interpretation of the data very difficult. Many studies did not include surgical debridement or removal of surgical implants, and thus this form of treatment should rather be viewed as palliative intervention. Because of the historical absence of standardised definitions and treatment strategies, older antibiotic treatment protocols are inconsistent with our current way of thinking. The duration of antibiotic treatment should rather be based on the treatment strategy selected, the realistic aim of treatment and the extent of the surgical margin. In theory, curative management strategies involving wide resection would only require a short period of antibiotics in order to sterilise the remaining soft tissue. In practice truly wide margins are, however, very difficult to achieve. Traditional thinking dictates a minimum of six weeks treatment in curative treatment protocols involving marginal debridement. Unfortunately there is insufficient evidence to make definitive recommendations and further studies are required in this respect.32 In palliative treatment strategies or in cases treated with intra-lesional debridement extended periods of antibiotics appear to remain appropriate. The efficacy of suppressive treatment in chronic osteomyelitis without an implant has, however, not been determined. In addition many of the older studies looking at long-term antibiotic therapy included patients with and without surgical implants as well as surgically and non-surgically managed patients. This lack of uniformity made comparison of results impossible and, again, illustrates the urgent need for the establishment of standardised nomenclature and treatment strategies in the management of chronic osteomyelitis. Chronic suppressive antibiotic therapy forms the cornerstone of palliative management in C-hosts. This form of treatment typically involves antibiotics that are prescribed for a period six months. If quiescence or sufficient suppression is achieved the antibiotics can be stopped. If the infection recurs after discontinuation of the therapy, a lifelong suppressive regimen should be considered.50 Various antibiotic regimens have been investigated. Due to the inferior results reported with single agents, and the efficacy shown with the addition of a second agent in the setting of implant-related infections, most chronic suppressive regimens generally involve the combination of two agents.55,56 Antibiotics used in suppressive regimens include cotrimoxazole, rifampicin, ciprofloxacin, cloxacillin, fusidic acid and clindamycin.38,45,57,58 Although directed therapy according to culture and sensitivity results is the ideal, this is frequently not practical and possibly not necessary in order to achieve clinical quiescence. The available literature suggests that cotrimoxazole and rifampicin can be considered as first line chronic suppressive antibiotic therapy.33 If these agents fail to achieve clinical suppression during the first six months, second line therapy may be instituted in the form of clindamycin or cloxacillin in combination with rifampicin, ciprofloxacin or fusidic acid. Over the past few decades considerable progress has been made in terms of our ability to reconstruct post-infective soft tissue and bone defects. Muscle or musculocutaneous flaps appear to be superior to random-pattern flaps (i.e. local flaps) in achieving resolution of infection and it is now generally accepted that primary closure of the wound may be performed at the same sitting as the debridement. Several factors need to be considered when dealing with post-infective bone defects, and the size of the defect serves as a useful guideline when selecting the appropriate treatment strategy. The soft tissue scarring associated with chronic osteomyelitis rarely permits acute shortening beyond 2 cm. Good results have been reported with cancellous grafting into an induced membrane and the Masquelet technique may be utilised in cases with bone loss of more than 2 cm. For bone defects larger than 4 cm distraction osteogenesis may be appropriate, while free vascularised fibula grafts may have to be considered for defects in excess of 12 cm. In terms of antibiotic therapy clear evidence-based guidelines are lacking, especially in terms of the selection of the appropriate antibiotic agents, the optimal duration of treatment and the ideal route of administration. Oral antibiotic agents that exhibit high bioavailability appear to be an acceptable alternative to parenteral therapy. Preferred oral agents, based on clinical and pharmacokinetic data, include fluoroquinolones, rifampicin and trimethoprim-sulfamethoxazole. In theory, curative management strategies involving wide resection would only require a short period of antibiotics in order to sterilise the remaining soft tissue. Traditional thinking dictates a minimum of six weeks of treatment in curative treatment protocols involving marginal debridement. In palliative treatment strategies and in cases treated with intra-lesional debridement, extended periods of antibiotics remain appropriate. The content of this article is the sole work of the authors. The primary author has received a research grant from the South African Orthopaedic Association for research relating to chronic osteomyelitis. This article is also available online on the SAOA website (www.saoa.org.za) and the SciELO website (www.scielo.org.za). Follow the directions on the Contents page of this journal to access it.